Nine days before the presidential inauguration of Donald Trump, Vice President Elect Mike Pence strode to the press conference podium. He reviewed the transition team’s progress in nominating cabinet secretaries, but quickly turned his attention to the “concerted effort . . . to delegitimize this election and to demean our incoming administration.” Although pledging his support for a free and independent press, he argued that “with freedom comes responsibility.” It was time, as he introduced the president, to return to “real news, to real facts and the real progress” of the Trump administration. Before addressing the six-decade-long story of drug coverage in American public programs and explaining what can be learned from successful international experiences, let us outline some major lessons of that history. It should help clarify why a blind, knee-jerk American faith in medical markets is misguided here, and why the president’s campaign criticism was right. Many drug companies are getting away with murder. 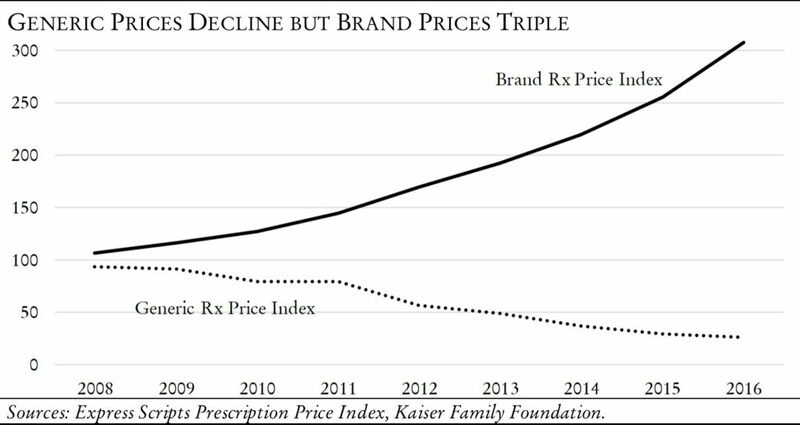 High and rising prices—all too often unrelated to the value a drug provides—are a design feature of the fragmented American system of medical care. Generic drug substitution has not and will not solve the problem. Two prior Republican administrations tried to address the growth in prescription drug costs by encouraging the substitution of generic for brand name drugs. The Ford administration in 1974 and the Reagan administration in 1986 implemented steps to increase the use of generic drugs. Every other administration since has shared this commitment to generics as a policy solution. Over the decades, policy-makers and health insurers have created powerful incentives to substitute generic for brand name drugs. 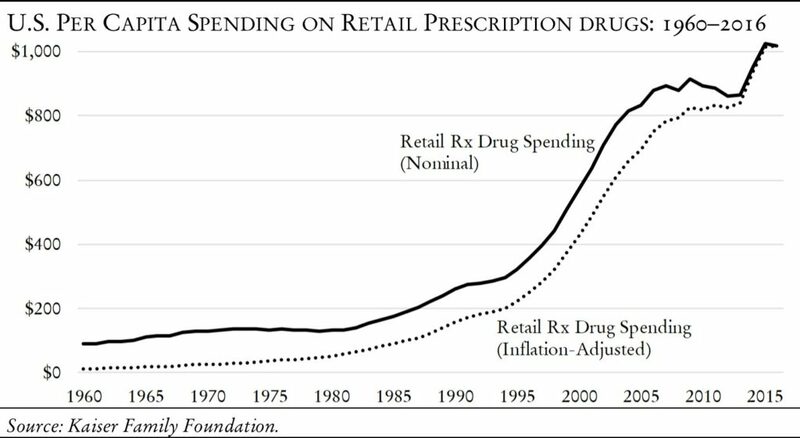 Today, one might be very surprised to learn that the percentage of prescriptions filled as generics is at an all-time high of 89 percent.8 Yet drug spending is also higher than ever. Brand name drugs, while constituting only 10 percent of prescriptions, deliver 72 percent of industry revenue.9 Whatever positive effect generic prescriptions produce gets lost in a sea of price increases for drugs for which no generics exist. And new branded drugs will continue to arrive in the years to come. Consumer incentives and other forms of market tinkering will not solve the problem. Over the last decades, policy-makers tried to make the market for prescription drugs work more efficiently. As a result, patients are directly paying an ever-increasing share of health care costs generally and drug costs in particular. From next to nothing as recently as three decades ago, cost sharing has grown to thousands of dollars per patient annually in the form of insurance premiums, co-payments (in dollars or percentage of costs), or deductibles. 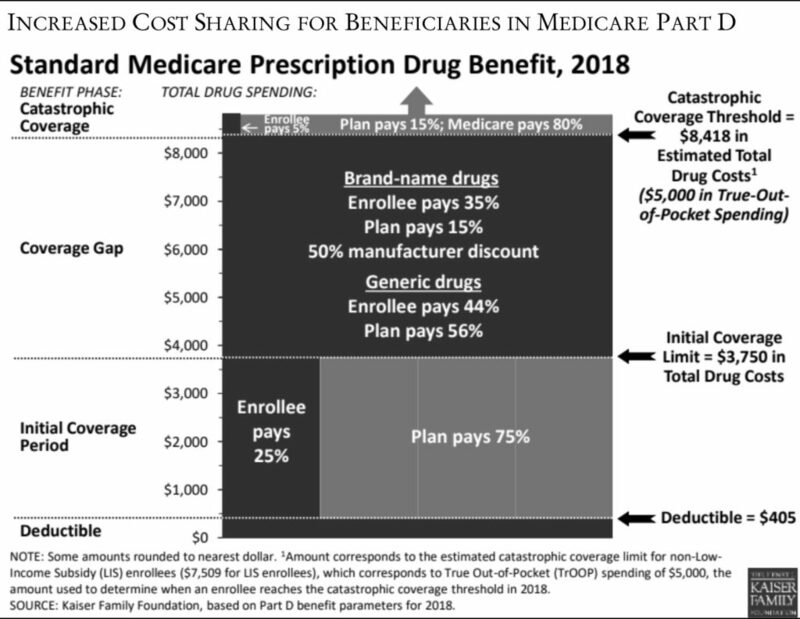 Medicare beneficiaries now face an amazingly complex cost-sharing scheme, and the possibility of unbounded drug costs. Unlike their hospital coverage (Part A) and medical benefits (Part B), there is no out-of-pocket limit for prescription drugs (Part D). Many private plans—but not the much-derided Obamacare plans—have this undesirable feature as well. Insurance does not reliably insure, and patients are increasingly exposed to “the market.” Nevertheless, overall expenditures continue to increase despite shifting more costs onto consumers. The unlucky sick bear a disproportionate share of system costs. Health care costs—including those of prescription drugs—are not randomly distributed across the population. Each year, 1 percent of the population accounts for around 20 percent of health care costs; 5 percent accounts for nearly 50 percent. Half the country incurs little or no health care expense in any one year.10 With such an underlying distribution, individuals are wise to insure against the risk of the high cost of illness or accident. This is worrisome for at least three reasons: First, Federal Reserve data show 41 percent of American families cannot cover an emergency expense of even $400,12 and many of those who can cover the $400 expense are unprepared for the shock of thousands of dollars of out-of-pocket health care costs. Second, those who pay more out-of-pocket costs tend to be in poor health, and are often limited in their ability to work.13 Third, we know from decades of study that access to and quality of care suffers when people face the choice between high health care cost sharing and buying other important staples of life, such as food and shelter. “One in four [Americans],” the Fed reported, “skipped a medical treatment in the past year due to an inability to pay.”14 With drugs, as will be shown, a substantial share of physician prescriptions actually go unfilled. The Trump proposal to reduce out-of-pocket exposure for Medicare Part D drugs is more a description of a problem than an actual solution. Tinkering around the margins is unlikely to ensure that citizens have ready access to the drugs their doctors prescribe. Those most in need face tremendous exposure to the high and rising costs of prescription drugs. Diffuse economic and political power is no match for the pharmaceutical industry. The standard argument offered by the Pharmaceutical Industry Association against government price negotiations is that drug development is a financially risky business. Innovation, the argument goes, requires large rewards for success since failure is so common. The cost of individual drug development is high and many promising ones fail to complete the arduous journey to market. There is surely some truth in this claim. But one might expect, if this dynamic defined pharma industry economics, that the performance of the sector over time would exhibit some great peaks and low troughs. Yet there is little if any data to support such a portrait. 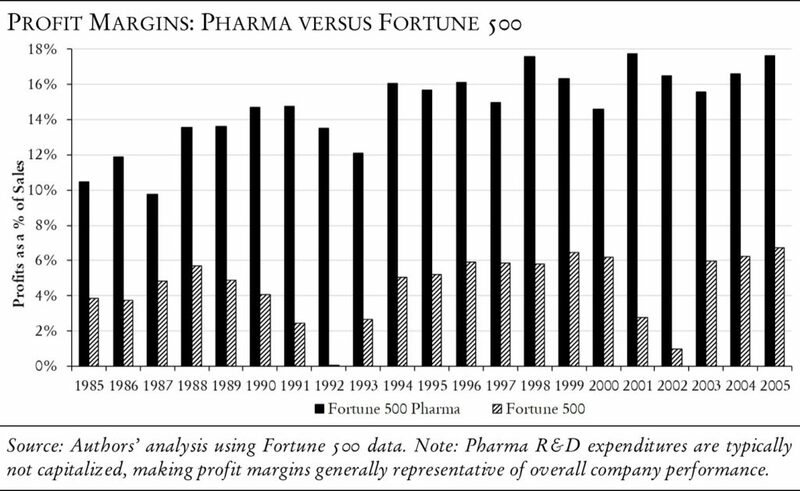 An analysis we completed a decade ago showed pharmaceutical companies earning significantly higher profit margins than the rest of the Fortune 500 every single year. The industry also demonstrated remarkable stability over time; even the recession of the early 1990s barely dampened sector performance. We attempted to replicate this analysis through the present day, but could not acquire the data.15 Instead, we examined the performance of a pharmaceutical industry index fund over the last decade. We compared it to the S&P 500 and a portfolio of U.S. Treasury bonds. What we found was quite similar to the earlier decades’ story. 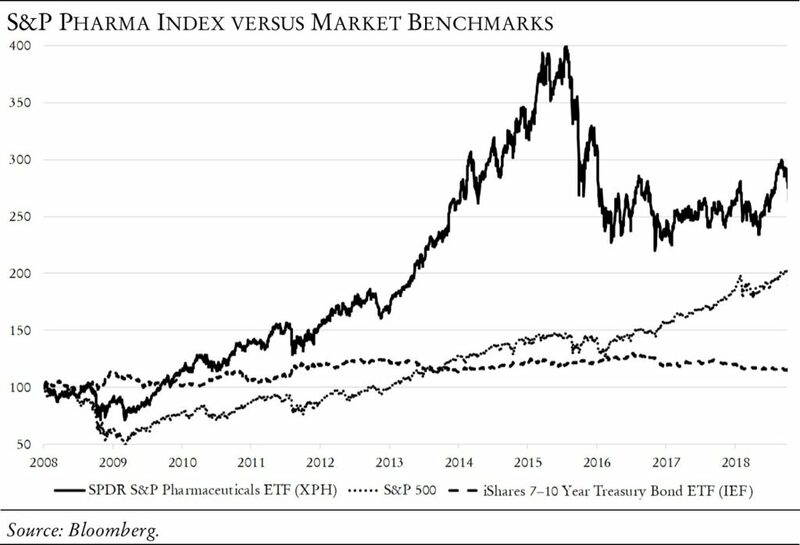 An investment in the pharmaceutical industry dramatically outperformed the other indices without exposing the investor to any sustained periods of underperformance. Note how a pharma investment in 2008–10, the greatest period of economic turbulence since the Great Depression, actually increased in value. In addition, large pharmaceutical companies have distributed tens of billions of dollars through share buybacks and dividends in recent years.16 Returning cash to shareholders in this manner suggests that these companies have more capital than they can profitably deploy in the development of new drugs. What are we to make of the large gap between the data on industry performance and the story of “risk” repeated by industry advocates? One interpretation is that while any one new drug is an expensive and risky development proposition, a portfolio of new drugs is not. Pharmaceutical companies are in effect large portfolios of existing, new, and future drugs. The performance data over three decades demonstrate that their executives are masterful at reducing—almost eliminating—risk. We will address in later sections of this article the economic and political strategies they use to maintain their market dominance. For now, however, we turn to the history of drug financing in the Medicaid and Medicare programs and the controversies it has generated. Medicaid, on the other hand, is not a social insurance program, but rather a “welfare” program designed to help those already impoverished. It is a joint federal-state program financed by general taxation. Total expenditures were $553 billion in fiscal 2016. Today seventy-six million citizens benefit; half of U.S. births and half of nursing home expenditures are paid for by Medicaid.19 Almost two-thirds of Medicaid beneficiaries are enrolled in private managed care plans overseen by state governments. The Medicare titles were entirely new; the Medicaid structure began with an historical legacy. What we now call Medicaid built upon and sharply expanded the Kerr-Mills program of 1960, which had provided limited federal subsidies to the states to finance health care for the poor among America’s elderly. Medicaid took that model of “welfare medicine” and added coverage for the “categorically needy”: the blind, the disabled, and children from poor families.21 How did this history shape assumptions about paying for hospital, medical, and drug expenses? The surprising enactment of Medicaid meant that its policies reflected consequential legacies from early welfare programs on the one hand and what Department of Health, Education, and Welfare officials generally assumed were workable, accepted policies for reimbursement on the other. Familiar organizational ways of thinking, in other words, were central to what was proposed and acted upon. Medicaid—like Medicare—set out to pay hospitals their “reasonable costs,” proceeding from standard practices in the Blue Cross world of private hospital insurance. In the case of physicians, Medicare’s legislative language called for reimbursing “usual and customary” fees.25 For Medicaid, neither physician nor prescription drug reimbursement was legislatively specified.26 Prescription drugs, an optional benefit, were in the first years of the program a modest and largely unnoticed component of spending. By contrast, there was considerable attention given to an acceptable general policy toward reimbursement issues in the struggle over Medicare’s provisions. In the hospital sector, the legislation reflected a carryover from the dominant mode of financing used by the Blue Cross plans at that time: reimbursement of what were thought to be “reasonable costs.” The understanding then was that Medicare would democratize access to health insurance by mirroring for the elderly what was available to a large proportion of working Americans through employer-financed hospital insurance. The legacy was cost-based reimbursement, and the legislation promised precisely that. In the case of physician payment, there was no established government or nongovernmental model as dominant as Blue Cross in the hospital sector. Blue Cross plans distinguished between indemnity payments for some insured and fee schedule reimbursement for low-income families. For reasons outlined in Theodore Marmor’s The Politics of Medicare,27 simply carrying over the Blue Cross model was rejected legislatively. Instead, the 1965 Congress enacted a standard of “reasonable charges”—charges based on what was described as “usual and customary” fees. The history of disputes about what “reasonable charges” meant in practice is not the focus here. But one should note that this payment standard for physicians mirrored the hospital reimbursement policy (paying what hospital care costs generally or what physicians typically charged their insured patients). This perspective—paying actual costs or market prices—carried over to the pharmaceutical area, but with far less legislative and executive attention. For Medicaid, whose expansive reform was the most unexpected, the presumption was that the program offered financial support to hospitals, doctors, and druggists who otherwise were asked to provide charity care. To the extent Medicaid payments subsidized a set of beneficiaries with more expanded financing than they enjoyed before, the program was thought to benefit both poor patients and their medical care providers. It is important to recall, however, that medical inflation quickly became an issue of intense concern in the late 1960s, especially with regard to both Medicare and Medicaid. A key focus of concern was the cost-based reimbursement policies with which both programs began. In Medicaid, a combination of higher than expected enrollment and greater than expected expenditures per beneficiary caused severe budget pressures in states, quickly drawing political attention. Amendments to the Social Security Act in 1967 limited program enrollment growth; the secretary of Health, Education, and Welfare was also empowered to use “methods and procedures to safeguard against payments in excess of reasonable charges for drugs consistent with efficiency, economy, and quality of care.”29 This tension between budget pressures and service aims would become a recurrent theme in Medicaid’s and Medicare’s history. But the role of prescription drug policy and politics in this history has, until quite recently, received relatively little scholarly attention. Rosemary Stevens’s 1974 case study of Medicaid, Welfare Medicine in America, identifies some conflicts over drug policy but makes no mention of reimbursement conflicts. Jonathan Engel’s more recent and comprehensive program history, Poor People’s Medicine (2006), barely touches on the topic of prescription drugs. What was important to governmental officials—and the pharmaceutical industry—simply has not received much attention in the journalistic or scholarly commentary about Medicaid. As a result, one has to put together a historical understanding from quite varied sources: government agency rule making and reports, congressional hearing transcripts, the journal articles of stakeholder groups, and scant newspaper coverage. To understand what stakeholders were doing over time one has to investigate what they said, what they thought they knew, what confused them, and what options for action they in fact had. With this approach in mind, we turn to the policy history as reflected in the available historical record. The states were initially given wide discretion in how they reimbursed drugs in their Medicaid programs during the period from 1967 to 1974.30 The U.S. Department of Health, Education and Welfare (HEW), while paying from 50 to 83 percent of Medicaid expenditures, delegated drug payment policy to the states. During that period, there were very rapid increases in drug expenditures. Nevertheless, because the baseline drug expenditures were comparatively small, the total drug outlays appeared modest in comparison to hospital and physician expenditures. 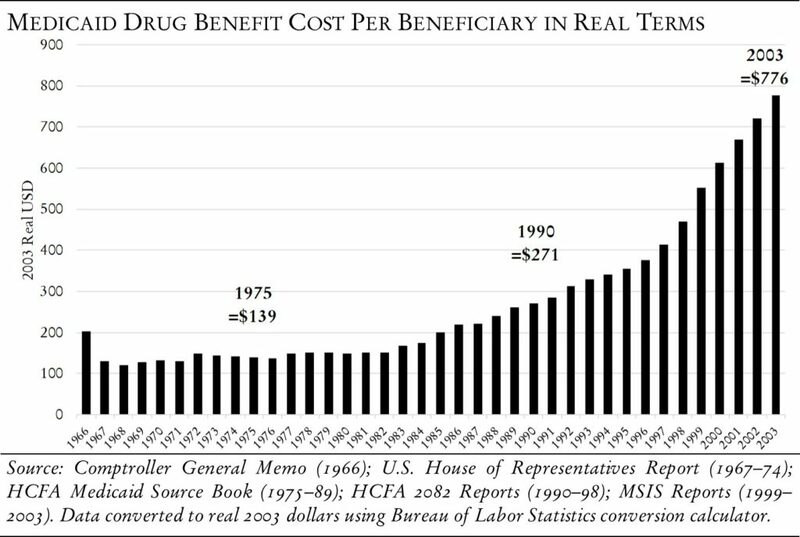 In 1974, however, the issue of drug price inflation did come onto the policy agenda. President Gerald Ford’s Health, Education and Welfare secretary, Caspar Weinberger, proposed federal regulations that prompted an outcry from the pharmaceutical industry. His initial proposal was to limit reimbursement for prescription drugs to their actual acquisition cost (AAC), plus a dispensing fee.31 For generic (multisource) drugs, the secretary suggested a Maximum Allowable Cost (MAC) basis for reimbursement. Both of these proposals proved controversial. First, opponents argued that governments did not have the technical capacity to determine actual acquisition costs on a timely and accurate basis. Secretary Weinberger, accepting this constraint and opposed to government price-setting, substituted estimated acquisition cost (EAC) for AAC.32 Nevertheless, Weinberger maintained the original MAC provisions33 despite opposition from the drug industry. (The final manifestation of that opposition came in the form of a lawsuit, which the plaintiffs lost.34) Thus began the complicated history of the government estimating what it costs pharmacies to buy drugs. The 1984 OIG report touched off political debate among those attentive to pharmaceutical issues and generated considerable confusion. The consequent dispute—and the confusion generated—undercut the OIG’s authority. Interest groups, especially retailers, barraged Congress with studies and testimony. They reiterated the same themes. Discounts from AWP prices might be available to some, the trade association contended, but not all, retailers. Critics also challenged the methods the OIG study used, including doubts about the generality of their findings. Some federal legislators defended AWP reimbursement itself, which made changes in formal policy more difficult. In 1985, the president of the National Association of Retail Druggists publicly claimed a lobbying victory for the continuation of the AWP basis for reimbursement.39 One phase of the political bargaining story was over. An effort to change the AWP standard was defeated—and with the explicit approval of pharmacy and drug manufacturing trade associations. To achieve savings required Medicaid to approve payment for generic drugs at a faster pace than before. Policy changes were required. And in 1986, ten years after the implementation of the Weinberger regulations, there was indeed a new set of proposals for reimbursing drugs under Medicaid. The Secretary of the Department of Health and Human Services (HHS) offered three reform options.42 Each encouraged greater use of generic drugs to reduce Medicaid’s program expenditures by streamlining the process of qualifying generic drugs for program reimbursement. One option, the Pharmacist Incentive Program, called for financial incentives to pharmacists to substitute generic for brand drugs. A second, the Competitive Incentive Program, would have required pharmacists to give Medicaid price discounts from actual retail prices, but it would have allowed pharmacists to make—or lose—money from brand and generic drug sales. In the end, however, HHS officials did not go ahead with any of these options. Intense objections by state governments, pharmacists, and drug manufacturers played a role.43 The result was that certain problems were once again highlighted, but overall drug reimbursement policy was not changed substantially.44 Instead, the HHS secretary ended the MAC program and created an upper limit on federal payments for two classes of drugs: multisource and others.45 For multisource drugs, reimbursement was capped at 150 percent of the lowest published price of the least expensive generic supplier. 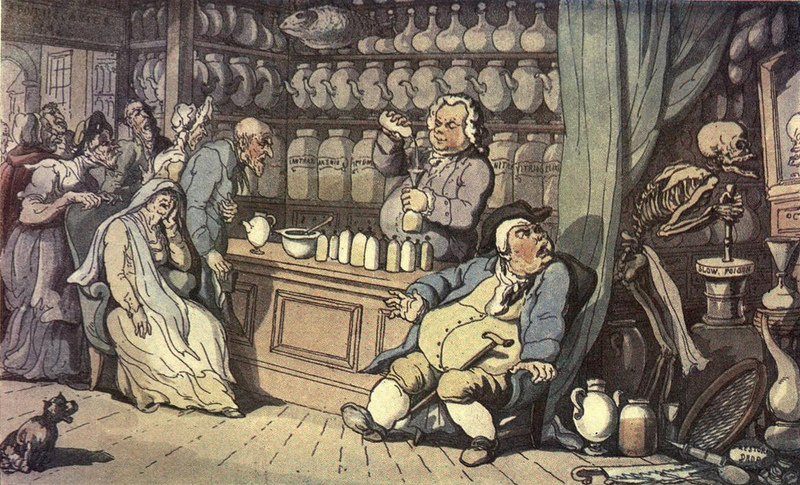 For single-source drugs, the final rule emphasized that “[T]he upper limit for other drugs . . . retains the EAC limits as the upper limit standard that state agencies must meet.” But the rule was to be applied “on an aggregate rather than on a prescription specific basis.”46 The standard for payment of drugs remained the lowest of three options: MAC (now called the FUL) plus a dispensing fee, the EAC plus a dispensing fee, or a pharmacy’s usual and customary charge (UCC). But other changes were forthcoming. Continued inflation in drug prices meant difficult choices for states. Some states tried quite different strategies to constrain drug inflation. All were of limited success. 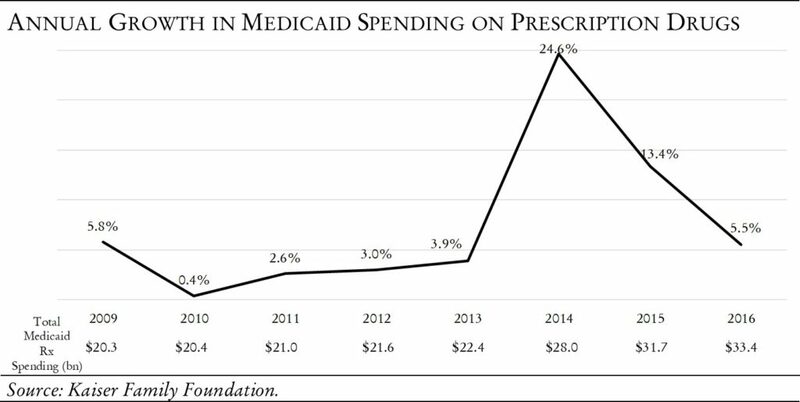 Given budget pressures and constitutional limits on deficit financing, the continuing medical inflation meant that states had to restrict Medicaid eligibility, reduce the number of prescriptions, and/or increase patient cost sharing for drugs. Another strategy was to use competitive bidding. Thirty-seven states tried putting drug contracts out for competitive bid. But almost all of them had their negotiating efforts “blocked” by drug companies unwilling to provide bids.50 One state, Kansas, eventually succeeded in obtaining a 30 percent price reduction, but only for one drug. This result illustrates a continuing feature of the American policy struggle over drug reimbursement. The drug industry on the one hand has resisted any type of governmental price setting for drugs, contributing to steady inflation in Medicaid pharmaceutical expenditures. On the other hand, the drug industry has also continuously employed political, legal, and economic strategies to thwart efforts to address that inflation with different policies. This combination of defense and offense against stronger alternatives is a major, underlying theme of this history. The strategy was repeated even more vigorously in the 1990s. At no time, however, did the industry fully inform the government of its real prices for reimbursement purposes. Nor did it acknowledge that it was promoting, through lobbying, a system in which reported prices had little or no relationship to actual prices and at times exerted questionable influence on medical judgment. Explaining the rapid increase of Medicaid and Medicare’s drug expenditures in the 1990s thus requires attention to developments that were at the time shrouded in secrecy, misrepresentation, and contested investigative claims of wrongdoing. In the end, congressional negotiations produced a complex legislative result. The Omnibus Budget Reconciliation Act of 1990 (OBRA 90) was the formal legislative product, of which the drug payment policy changes were but one part. OBRA 90 was a bargain: it included side payments (rebates) by manufacturers to state and federal governments on all drugs if states gave up the use of formularies as cost control instruments. Rebates were—and are—proportional payments paid on the basis of a reported “best price” or average manufacturing price (AMP). AMP and “best price” were to be confidential prices reported by drug companies only to the HCFA/CMS office with responsibility for administration of rebates.53 State governments did not have access to these prices.54 In short, whether drug firms reported AWP or WAC accurately did not make any fiscal difference to what was owed in rebates. This understanding of rebates illustrated the degree to which the OBRA legislation was about high drug prices and governmental budgetary relief55 rather than the price reporting practices of drug firms or the reform of drug reimbursement policy. During this period, officials at a home infusion provider, Venacare (VAC), conducted a campaign to reveal what they regarded as fraudulent conduct in price reporting by manufacturers of drugs for use by Medicare and Medicaid.59 VAC—assisted by lawyers operating under the provisions of the False Claims Act—reported their understanding of the marketing practices and actual drug prices of certain drug manufacturers to a wide variety of federal and state officials. They made extended presentations to state attorneys general, officials at HCFA, the HHS OIG, state Medicaid Fraud Control Units, the DOJ, and Congressional investigators. They emphasized that some drug firms were creating and marketing very large spreads between acquisition costs and published prices for Medicare and Medicaid reimbursement. VAC’s presentations would become a major stimulus to congressional scrutiny of the pharmaceutical industry’s pricing practices. Over a decade, they were largely successful in transforming governmental understanding from what had been disputes about the extent of the gap between reported and actual acquisition prices into widespread awareness of the outrageous and deliberate misrepresentation of drug transaction prices to Medicaid, Medicare, and their fiscal intermediaries. Without VAC’s participation, the course of drug reimbursement policy might well have been very different. A revealing illustration of VAC’s influence was the conversion of leading congressional actors to their point of view. The Congressional Commerce Committee began its investigation of Medicare drug payments in 1999.60 Within a year, the committee chairman, Congressman Thomas Bliley (R-Va.), was sufficiently concerned about VAC’s representations to share information on his findings through sharply worded letters to Clinton administration officials. These emphasized the “setting and marketing of the spread” between reimbursement amounts and drug costs and the worrisome “impact of the spread on utilization decisions.” (It is noteworthy that Democratic congressman F. Pete Stark—the most experienced health policy figure on the House Ways and Means Committee—also wrote a letter with similar charges to the firms under investigation by Congress.) The process of converting congressional actors into agents of policy change was, with bipartisan support, well on its way. VAC’s revelations provided congressional officials with a clearer understanding of the realities of drug firm pricing practices. But the VAC campaign was not, it is plain from the historical record, the only reform development in this period. The DOJ initiated its own investigation, understandably unwilling to accept allegations from others as the sole basis for intervention. Its investigation would take time, but it also provided a different channel of governmental action from the mid-1990s on. Moreover, the DOJ investigation separated HCFA/CMS leaders’ concerns about the gaps between actual and estimated drug acquisition costs from the broader charges at issue for the DOJ. Accordingly, we now turn to a brief review of the policy disputes and developments in the Medicare channel. As noted earlier, Medicare has from the outset faced serious budgetary problems from continuing inflation in medical prices and consequent increases in program expenditures. The role of drugs in that inflationary development would, in the 1990s, become a more substantial object of concern. The processes by which Medicare came to different policies towards drug reimbursement after 2003 are complicated, calling attention to what might seem like unrelated phenomena. To understand these developments requires identifying first how Medicare has dealt with inflationary forces in the major components of program expenditure—physician payment and hospital financing. Between 1975 and 1987, Medicare’s spending per enrollee for physician services had grown at an average annual rate of 15 percent, almost twice as fast as the per capita gross national product.64 That, in turn, prompted legislative reaction, just as, earlier in the decade, Congress had agreed to large changes in how Medicare paid for hospital services under Part A.65 In 1986, Congress created the Physician Payment Review Commission (PPRC) to provide advice on ways to reform Medicare’s method of paying physicians. By December 1989, Congress, acting on the advice of PPRC, mandated that Medicare’s physician payment methodology be revised by HCFA. In place of the previous charge-based reimbursement methodology, payment levels were to be determined on the basis of the relative resources required—including physician work effort, practice, and malpractice expenses—to deliver medical services. The development and implementation of this “resource-based relative value scale system” (rbrvs) would, it was widely hoped, slow the growth in Part B spending for physician services. The rbrvs regulations became effective on January 1, 1992.69 From 1992 until the Balanced Budget Act of 1997, the reimbursement policy for Part B drugs remained the same. The scant historical information available suggests that OMB blocked HCFA from using the survey instrument because of paperwork concerns. AWP became the de facto payment mechanism. With the election of a Republican Congress in 1994, the debate over spending control and budget-balancing became more vociferous. In health care policy, some commentators, including the GAO, claimed that 10 percent of Medicare spending was the result of “waste, fraud, and abuse.” In August 1996, Congress passed the Health Insurance Portability and Accountability Act (hipaa), one provision of which allowed funds recovered from government health care fraud litigation to be invested back into government litigation efforts. 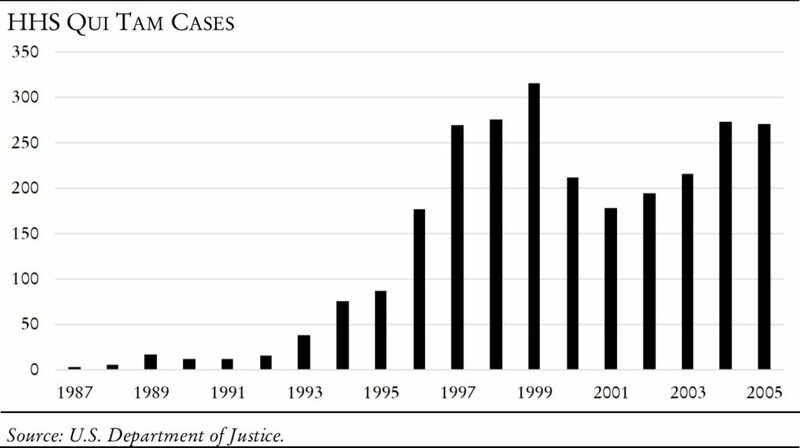 These qui tam fraud cases multiplied in the decade that followed, as did settlement totals.70 All of these developments were part of a separate channel of governmental behavior. The 2000 legislation—and its aftermath—reflected the confluence of the three channels we have described. Drug pricing revelations became more public and more contested. For example, the National Association of Medicaid Fraud Control Units (namfcu) escalated the attack on the reliability of reported drug prices. According to namfcu, the transaction prices were much lower than published AWPs.78 In September 2000, HCFA sent Medicare carriers its list of prices along with qualifications for their usage.79 The provider community appealed to Congress against usage of these prices. By November, HCFA sent a memorandum to carriers instructing them not to use the prices, and Congress ordered the BIPA study.80 This combination of revelation, reaction, hesitancy, and further study is typical of controversial reform politics in America. Interpretation is not simple. Knowing the balance of influences that generated this sequence is itself a substantial research task. But what can be claimed with confidence is that the bargaining over a substantial change in drug reimbursement policy began in earnest during this period. The effects of the MMA were dramatic: 22 million Medicare beneficiaries gained drug coverage in 2006 upon implementation of the law. By 2018, the number had grown to just over 43 million beneficiaries.86 Medicare replaced Medicaid as the dominant public payer for drugs. Out-of-pocket expenses for drugs—once the norm for seniors—fell from 25 to 14 percent of all drug spending. The Patient Protection and Affordable Care Act (ACA), better known as “Obamacare,” changed the landscape for prescription drugs in two major ways. First, by expanding the pools of publicly (Medicaid) and privately insured (federally subsidized Exchange Plans) patients, the ACA ensured that many who were previously uninsured now had access to health insurance with prescription drug coverage. Second, a variety of changes were made in the Part D benefit structure. These adjustments tended to reduce cost sharing for Medicare beneficiaries. With respect to Medicare, the MMA had covered beneficiaries’ drug expenses (after a $250 deductible) up to $2,000 (less a 25 percent co-insurance charge). Then coverage disappeared until the beneficiary reached $3,600 in drug expenses. This “doughnut hole” ensured that many seniors would face challenging cost sharing. After the $3,600 mark, coverage kicked in again for 95 percent of costs. ACA reduced the size of the donut hole. Instead of having to pay the full cost of medications while in the donut hole, beneficiaries would now pay a percentage of the cost. That percentage has been declining since 2011, but the upper limit of the donut whole has increased as well, to just over $7,500 of drug expenses. For most, this is catastrophic health insurance, not what many Americans thought drug coverage was supposed to mean. One of the main drivers of increased spending in public and private health insurance programs has been the emergence of high-priced “specialty drugs.” They are often provided intravenously in outpatient settings and are used to treat modern scourges such as hepatitis C, multiple sclerosis, rheumatoid arthritis, ulcerative colitis, Crohn’s disease, and various cancers. Over the last decade, their average annual price tags have tripled to over $50,000.91 Since there is typically no competition among manufacturers for these specialty drugs, nothing prevents these companies from setting high prices and raising them at will. The typical list of reforms advocated by those—including, it seems, President Trump—who wish to tinker with the existing American prescription drug system is vast. One proposal is to reduce the period of manufacturer market exclusivity and end the gaming that extends patents or grants new ones for subtly changed formulations. Another is to stop pay-to-delay deals that slow generic availability. Others include curtailing direct-to-consumer advertising, and increasing resources to the FDA to speed up drug approvals. Most reforms call for importation of drugs from Canada and promote generic and therapeutic substitution by pharmacists in all states. They urge states to use formularies in the Medicaid program, to give consumers more shopping tools, to speed up the entry of biosimilars—we could go on (and on). All of these have some merit. But none of them independently, nor any set of them collectively, is likely to change the American path of ever-increasing outlays for drugs. How do we know this? The six-decade history we have described is one basis. These solutions—many of them offered by the president—are not new. Many have been tried, and others have not passed legislative muster. Why one might expect anything different in the future is puzzling. Argument two is the international experience. 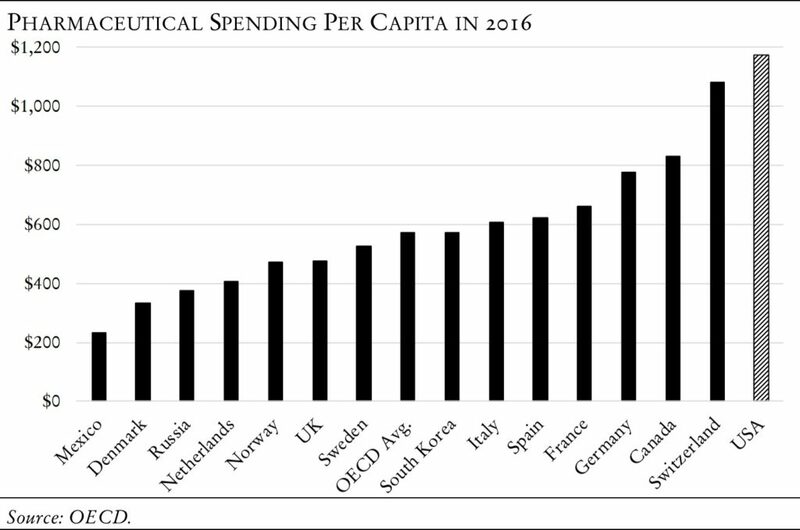 As we showed in the introduction, Americans spend vastly more per person on drugs than do citizens of the world’s most economically advanced nations. These countries do not rely on consumerism or generics or market tinkering to control drug costs. They do not ration drugs. Their citizens have full access to the array of pharmaceutical innovations the market offers, typically without the cost-sharing that plagues Americans. (Their citizens also live, on average, longer than Americans.98) See the chart below for some of the discounts obtained for the brand name drugs that menace public and private health payer budgets. How do they do it? Simply put, these governments control entry to their markets and use a variety of techniques to negotiate prices on behalf of their citizens.99 Drug companies are free to walk away from negotiations that do not guarantee an acceptable profit. But, unlike in America, they cannot flex their monopoly muscle to create economic rents, also known as supernormal profits. Many Americans have a knee-jerk reaction against government power being used in such a manner, and the general appeal of market solutions is unsurprising. But, as we have seen, the polling data—even among Republican voters—show we are willing to make an exception here. And in light of the unique characteristics of health care that prevent the operation of typical market forces on this sector, such an exception seems warranted. Markets work when well-informed consumers shop for high-value products, those with a high ratio of quality to price. Suppliers respond by trying to improve product quality and drive down costs. Over time, only high-value products in great demand tend to survive. In most product markets, we see value rising over time. Think about how computers have become smaller, cheaper, and more powerful. Would not these same market dynamics apply to health care goods, such as prescription drugs, as well? We know from neoclassical microeconomic theory that there are many reasons to doubt they would. We know from observation that they do not—for health care generally and for prescription drugs in particular. Most prices for health care goods and services rise continuously. Provider and pharmaceutical company incomes mostly rise. Many innovations, particularly in life-saving care, cost small fortunes and improve outcomes only slightly. (The new hepatitis C drug stands as a rare counterexample of a drug that actually does cure a dreaded disease, yet Wall Street somehow finds this a poor business model.100) The market produces a mix of effective and ineffective care that is misused, overused, and underused. Why is health care different? There are a number of reasons. First, consider the demand side of health care. Patients, renamed “consumers” for purposes of market analysis, do not tend to shop for care. They may be ill or injured, incapable of shopping. Even if they can, how do they know what they want or need? They ask their health care provider—the seller of health care goods and services—what they should do. The theoretical assumption of well-informed consumers does not apply to the use of most health care. Moreover, even for those well-informed, there are other stumbling blocks. Whatever we learn, we typically don’t know more than an educated provider. We can only speculate as to whether the recommended care or drug is optimal. Thus, what economists call information asymmetry typically exists between consumer-patients and supplier-physicians. This is not a condition that leads to optimal outcomes of low prices and high quality. In addition, rational actors—or at least the subset of those who can afford it—buy health insurance to protect against financial ruin. When fully insured, we are without financial concerns about the cost of care; we have prepaid for our care and are in that respect liberated from fiscal concern. Most Americans, it appears, have little interest in being conscientious consumers who shop for better-priced care. On the other hand, when partly insured or uninsured, we may forego necessary care entirely because we want to save our share of the costs. This is particularly true of lower income patients. Decades of study show that cost sharing reduces patient utilization of all medical care, not just unnecessary care. 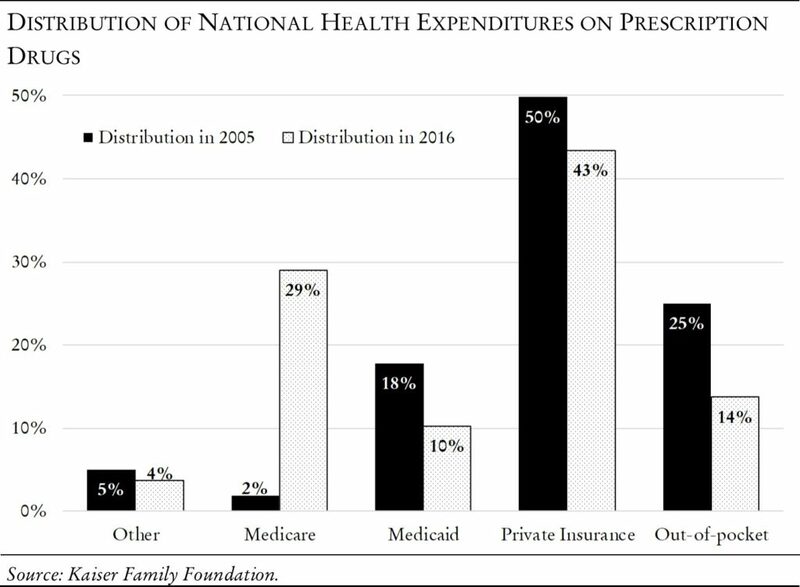 As the size of the cost sharing rises for prescription drugs, the rate of “prescription abandonment” grows.101 One study showed 31 percent of prescriptions written by doctors were never filled.102 System costs may go down, but so does health status. This is hardly evidence that patient cost consciousness leads to an efficient health care market. There are yet more differences in how we should think about health care economics. We do not fret much if consumers in many other markets cannot afford the products they desire. Wanting a more fashionable smartphone or a new car does not justify its social provision. But what if a tuberculosis victim is unable to afford the hospital? We all risk infection and that provides one basis for social provision. From a more altruistic perspective, what if an AIDS baby’s parents can’t afford the high cost of prescription drugs that can control the disease? No one wants to let that baby die. There is in health care economics a community interest. Both enlightened self-interest and moral obligation lead most of us to want outcomes that normal market forces alone cannot reliably produce. In drug markets, the “invisible hand” fails to drive down costs, improve quality, or ensure sound distributional outcomes. Could President Trump and the sitting Congress give the federal government power to negotiate or collect bids on behalf of citizens? Of course, it is possible, and the devil will surely be in the details of the policy that emerges. We must adapt our solution to the fragmentation that exists on the health care payer side. Not all will benefit equally today from the government wielding the new power of negotiation with drug companies. But all will benefit eventually. As of the fall of 2018, it is not at all clear that President Trump will deliver on the promise of reform on which he campaigned in 2016, despite the overwhelming majority of Americans in support of the federal government negotiating with drug companies to reduce prices. What is clear is that disputes about the financing of prescription drugs will continue as a divisive issue in American politics and policy. 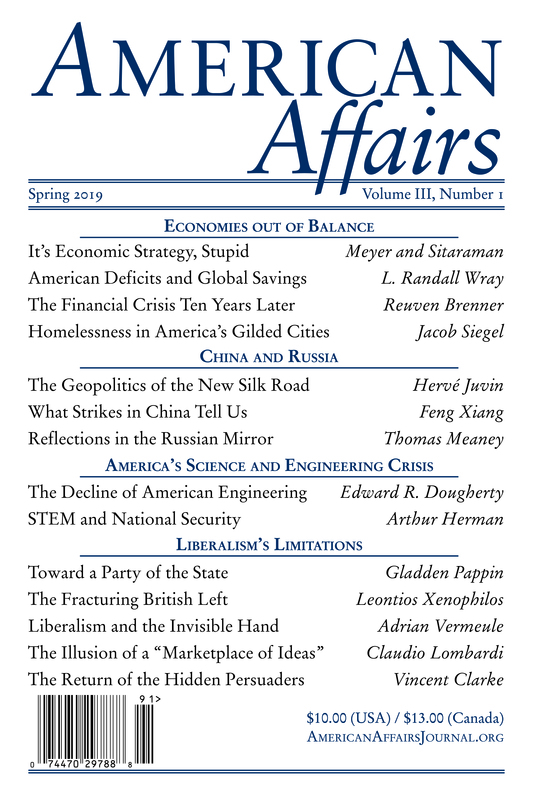 This article originally appeared in American Affairs Volume II, Number 4 (Winter 2018): 103–44. 1 Donald Trump, news conference, Jan. 11, 2017. 2 Kaiser Family Foundation, “10 Essential Facts about Medicare and Prescription Drug Spending,” Nov. 10, 2017. 3 White House, “President Donald J. Trump’s Blueprint to Lower Drug Prices,” fact sheet, May 11, 2018. 4 The markets agreed. “Health-care companies across the drug supply chain had been nervous in the run-up to Trump’s speech, with stocks dipping as he began his remarks before ending higher at the close of trading.” Carolyn Y. Johnson, “Trump Promises to ‘Derail the Gravy Train’ and Lower Drug prices in ‘American Patients First’ Plan,” Washington Post, May 11, 2018. 5 Associated Press, “Drug Prices Climb Despite Trump Promise, Investigation Finds,” Sept. 25, 2018. 6 U.S. Department of Health and Human Services, “HHS Advances Payment Model to Lower Drug Costs for Patients” (news release), Oct. 25, 2018. 7 Kaiser Family Foundation, “10 Essential Facts about Medicare and Prescription Drug Spending,” Nov. 10, 2017. 8 Food and Drug Administration, Office of Generic Drugs, “2016 OGD Annual Report,” Jan. 2017. 9 General Pharmaceutical Association, “Generic Drugs Continue to Deliver Billions in Savings to the U.S. Healthcare System, New Report Finds,” Oct. 19, 2016. 10 Bradley Sawyer and Nolan Sroczynski, “How Do Health Expenditures Vary Across the Population?,” Kaiser Family Foundation, Dec. 1, 2017. 12 Federal Reserve Board, “Report on the Economic Well-Being of U.S. Households in 2017,” May 2018. 14 Federal Reserve Board, 25. 15 Fortune now charges $1,000 per year for its data. Drug pricing is not the only market with inflation! 16 Bob Herman, “Pharma’s $50 Billion Tax Windfall for Investors,” Axios, Feb. 22, 2018. 17 Center for Medicare and Medicaid Services, NHE Fact Sheet, April 17, 2018. 18 Juliette Cubanski and Tricia Neuman, “The Facts on Medicare Spending and Financing,” Kaiser Family Foundation, June 22, 2018. 19 Robin Rudowitz and Rachel Garfield, “10 Things to Know about Medicaid: Setting the Facts Straight,” Kaiser Family Foundation, March 12, 2018. 20 Theodore R. R. Marmor, The Politics of Medicare, 2nd ed. (London: Routledge, 2017), 49–53, 60. 21 The health status of America’s poor—especially poor children—in the mid-1960’s is hard to imagine today. Jonathan Engel’s book chronicles a number of shocking reports of the era. One on children’s health in rural Mississippi in the early 1960s found “in child after child . . . evidence of vitamin and mineral deficiencies; serious, untreated skin infections and ulcerations; eye and ear diseases, also unattended bone disease secondary to poor food intake, the prevalence of bacterial and parasitic disease . . . children afflicted with chronic diarrhea . . . leg and arm injuries and deformities.” Another in Kentucky discovered that “children displayed skin ulcerations, tooth decay, open sores, boils, abscesses, impetigo, rat bites, and hookworm.” And a House Ways and Means Committee investigation concluded “that half of all children in the United States under the age of fifteen had never been to a dentist.” Jonathan Engel, Poor People’s Medicine: Medicaid and American Charity Care since 1965 (Durham: Duke University Press, 2006), 49, 74–75. 22 From May 1967 until February 1969 an HEW Task Force on Prescription Drugs undertook a “comprehensive study of the problems of including the costs of prescription drugs under Medicare.” Task Force on Prescription Drugs, Final Report, U.S. Department of Health, Education, and Welfare (Washington, D.C.: Office of the Secretary of Health, Education, and Welfare, 1969). 23 Supplemental “Medigap” insurance policies available to Medicare beneficiaries since the 1980’s often covered prescription drugs. See Jonathan Oberlander, The Political Life of Medicare (Chicago: University of Chicago Press, 2003), 60. 24 Oberlander, 46. The detailed account of how Medicare’s Part B and Medicaid got added to the original proposal of hospital insurance in 1965 is in Marmor, The Politics of Medicare, chap. 6. 26 Rosemary Stevens interprets the differing standards in the following way: “presumably ‘reasonable cost’ . . . would bear a direct relationship to the actual cost of services provided. . . . For other services provided under Medicaid, states could, however, choose their own formulae and set their own payment schedules. These alternatives could include the long welfare tradition of reimbursing at less than cost, in other words, expecting providers to donate out of charity.” See Robert Stevens and Rosemary Stevens, Welfare Medicine in America: A Case Study of Medicaid (London: Routledge, 2017), 66. 27 Marmor, 89. The legislation borrowed instead from the commercial insurance practice of the time in the reasonable charge standard, with Aetna’s plan for federal employees as the particular source. 28 Statement of Austin Smith, MD, President, Pharmaceutical Manufacturers Association (PMA), in the U.S. Senate Committee on Finance, May 13, 1965, 760. 29 “Reimbursement of Drug Cost: Medical Assistance Program,” 39 Fed. Reg. 41480 (Nov. 27, 1974). 30 It took over two years for any federal regulations to be developed in this area. HEW used an interim policy for drug reimbursement of “actual acquisition cost” (“Reasonable Charges: Notice of Interim Policies and Requirements,” 33 Fed. Reg. 10233–34 (July 16, 1968)), but after a comment period settled upon a policy of “cost as defined by a state agency plus a dispensing fee.” (“Final Rule: Administration of Medical Assistance Programs: Reasonable Charges,” 34 Fed. Reg. 1243–45 (January 25, 1969). 32 “Final Rule—Limitations on Payment or Reimbursement for Drugs,” 40 Fed. Reg. 32109 (July 31, 1975) and 34333 (August 15, 1975). A vital aspect of Weinberger’s alternative was an attempt to increase the capacity of states to acquire accurate data on market prices so close estimations of AAC could be derived. 34 “Pharmaceutical Industry Sues HEW on Government Drug Price-Setting Program,” PMA Newsletter 27 (October 1975): 3. 35 These dispensing fees had some obvious justification. When filling prescriptions, pharmacy businesses incur costs beyond the price of the drug itself. These include expenses such as pharmacist and other employee wages, utilities, rent and overhead. Dispensing fees are paid when pharmacists are reimbursed on an EAC or MAC basis. It has not applied to funding drug costs on a UCC basis, where the cost of dispensing is built into the charge to the paying customer. From the perspective of academic policy analysis, however, there is no single, accepted, correct way to compute actual dispensing costs. There are contested questions that attend this task: the allocation of overhead, for example, how to deal with negative and positive externalities, and the computation of an enterprise’s average as opposed to marginal costs. This means that there is an irreducible uncertainty about what counts as the right dispensing fee. On the other hand, what pharmacists are willing to accept from other payers—rather than declining the business—is one basis for calculating an appropriate level of payment. The Medicaid program has never agreed to finance excess reimbursement for ingredient costs in order to make up for any shortfall in dispensing fees. The documentary record shows clearly that separate provisions were designed and implemented for each type of expense reimbursement. Both components were to be reimbursed independently of one another. The policy for Medicare has been analogous. Significant efforts have been made to reimburse providers for their cost of administration for “incident to” drugs. No “cross-subsidy” policy ever existed. 36 “Final Rule—Limitations on Payment or Reimbursement for Drugs,” 40 Fed. Reg. 32289 (July 31, 1975). 37 Stephane Jacobzone, “Pharmaceutical Policies in OECD Countries,” Four Country Conference: Pharmaceutical Policies in the U.S., Canada, Germany and the Netherlands, July 2000. 38 HHS OIG Report, “Title XIX of the Social Security Act, Limitation on Payment or Reimbursement for Drugs,” Sept. 1, 1984. We are aware of the historical disputes about how the expression AWP was employed. It was part of the rhetorical record, with different actors claiming to have a unique understanding of the practice—as opposed to the dictionary definition of the words, or plain, ordinary meaning. The historical record does not show evidence of any government statute, regulation, or official pronouncement stipulating a distinctive—i.e. different from the dictionary—meaning of “average wholesale price.” There was indeed some evidence of industry collaboration on pricing matters during the period. See “Ruling in Price-Fixing Case Provides a Look at Drug Industry,” New York Times, April 14, 1996. 39 The NARD President called attention to the group effort to block legislative change: “Just as a coalition approach worked wonders in foiling the fed’s attempt to eliminate AWP as a basis for Medicaid reimbursement,” he warned, “unfair pricing will also require a coalition. . . . NARD has talked with the National Association of Chain Drug Stores, the PMA, and the National Wholesale Druggists’ Association. They are all ‘supportive’ of the idea in l985.” (“NARD Leaders Reveal Alliance against Differential Pricing,” Drug Topics, November 18, 1985: 68–69). 40 “Law Enacted to Spur Generic Drug Market,” New York Times, September 25, 1984. 41 Another development, to be discussed later, was what came to be called the whistleblower statute of 1986 and related programs to address alleged waste and fraud in governmental payments for goods and services. 42 “Proposed Rule: Medicare and Medicaid Programs; Limits on Payments for Drugs,” 51 Fed. Reg. 29545 (August 19, 1986) and 33027 (September 18, 1986). 43 “Final Rule: Medicare and Medicaid Programs; Limits on Payments for Drugs,” 52 Fed. Reg. 28650 (July 31, 1987). 44 It should be noted that there were changes in the process of generic drug approval for Medicaid reimbursement. The point here is that the fundamental basis of reimbursement was reviewed, but not authoritatively altered. In addition, we found no evidence of a changed policy towards cross-subsidizing pharmacists. In short, the claim that in the 1980s the federal government’s Medicaid officials accepted that pharmacists should be cross-subsidized by inflating acquisition costs is without empirical foundation. Indeed, HHS rejected proposals to have pharmacists increase revenues from sources other than the dispensing fees. This does not deny that pharmacy interests regularly promoted increased revenue, wherever it could be found. That is expected from interest groups in American politics. 45 “Final Rule: Medicare and Medicaid Programs; Limits on Payments for Drugs,” 52 Fed. Reg. 28650–53 (July 31, 1987). 46 52 Fed. Reg. 28653. Some have suggested the “in the aggregate” language in this regulation changed the policy to one in which the sum of ingredient cost and dispensing cost would be considered as the standard for payment. By this reasoning, it was legitimate to pay higher than estimated ingredient costs if lower than cost payments were made for dispensing fees. We have seen no evidence that such a policy was ever implemented or that such criteria were used for evaluation. In fact, after 1987, the OIG and GAO continued to judge program performance by looking at the gap between estimated and actual ingredient acquisition costs, not any gap between the sums of the two components. 47 An exception was when a state tried to use undiscounted AWP as the method of estimating drug ingredient acquisition cost. 48 Milt Freudenheim, “Cutting the Cost of Medicaid Drugs,” New York Times, Jan. 30, 1990. 49 Milt Freudenheim, “Price Revolt Spreading on Prescription Drugs,” New York Times, Nov. 14, 1989. 50 “Skyrocketing Prescription Drug Prices,” U.S. Congressional Hearings and Majority Staff Report, Nov. 16, 1989 and Jan. 1, 1990. 51 In 1989, the members of the Senate Special Committee on Aging heard testimony by Gerald Mossinghoff, President of the Pharmaceutical Manufacturers’ Association, indicating that “average wholesale price is not determined by our companies. It’s determined in part by surveys done of our companies.” Skyrocketing Prescription Drug Prices: Hearings, Before the Special Committee on Aging, United States Senate, 101st Cong. 157 (1989) (statement of Gerald Mossinghoff). 52 For evidence of the extent to which the Merck program and eventual OBRA 1990 deal were seen as a trade of rebates for open formularies, see “Merck Is Offering to Cut Drug Costs of Medicaid Uses,” New York Times, April 21, 1990; “PMA Board Approves Medicaid Rebate Plan,” PMA Newsletter, Oct. 1, 1990; and “Medicaid Best-Price Drug Plan Written into Budget Summit Agreement,” PMA Newsletter, Oct. 8, 1990. 53 OBRA 90 defined the original rebate formulas. For single-source and innovator-generic drugs, the rebate is the greater of 15.1 percent of the AMP or the full difference between the AMP and best price available in the market place. Rebates for generic drugs were initially a flat 10 percent of the AMP, and increased to 11 percent after 1993. 54 Manufacturers are supposed to pay states a Unit Rebate Amount (URA) for each of their drugs based on the application of the appropriate formula. 55 Robert Pear, “The Struggle in Congress; Most in US Will Feel Effect of Shift in Spending Priorities,” New York Times, October 28, 1990. 56 Consider this New York Times report: “But a lobbyist for the drug industry, who would speak only on the condition of anonymity, said ‘We are surprised that Senator Pryor is surprised. I don’t know what else he would have expected. It’s logical that companies would re-examine their prices if Congress passes a law saying that Medicaid, which accounts for 10 percent of our revenues, must get the best price given to any pharmaceutical customer in the country.’” Robert Pear, “Medicaid Is Denied Discounted Drugs Despite a New Law,” New York Times, Feb. 18, 1991). 57 Fiona Scott-Morton and Mark Duggan, The Effect of Medicaid Regulations on Drug Product Introductions and Pharmaceutical Prices, April 5, 2004, introduction p. 2 and conclusion p. 2. 58 The OIG reports over this period focused on the gap between estimated and actual drug acquisition costs. Eleven OIG reports in 1996–97 focused on Medicaid’s drug payment experience in a sample of states. Two others in 1997 and 2001 focused on similar issues in Medicare outpatient drug reimbursement. 59 VAC was a home infusion provider in Florida that brought a qui tam suit against National Medical Care (NMC) in the early 1990s. Their principal officers alleged violations under the Stark anti-fraud statute. Eight years later, in 2000, NMC (by then a unit of Fresenius) settled with the United States for $486 million. At that time, the settlement was “the largest case of its kind.” See Jennifer Steinhauer, “Justice Dept. Finds Success Chasing Health Care Fraud,” New York Times, Jan. 23, 2001. 60 USA Today reported on the growing concern of congressional investigators, and noted that “some of the documents . . . come from a whistleblower, Ven-ACare pharmacy.” See Julie Appleby, “Drugmakers Accused of ‘Unethical’ Pricing,” USA Today, Sept. 27, 2000. 61 Medicare Drug Reimbursements: A Broken System for Patients and Taxpayers: Joint Hearing, Before the Subcommittee on Health and the Subcommittee on Oversight and Investigations, 107 Cong. (2001). 62 Medicare Drug Reimbursements, 107 Cong. 48 (2001). 63 Medicare Drug Reimbursements, 107 Cong. 88 (2001). 64 Medicare Physician Payment: Geographic Adjusters Appropriate but Could Be Improved with New Data, GAO-HRD-93-93: 3. 66 Medicare Program: Fee Schedule for Physicians’ Services (Proposed Rules), 56 Fed. Reg. 25800–1 (June 5, 1991). 67 Medicare Program: Fee Schedule for Physicians’ Services (Final Rules), 56 Fed. Reg. 59507 (November 25, 1991). 68 Medicare Program: Fee Schedule for Physicians’ Services (Final Rules), 56 Fed. Reg. 59524. 69 The practice and malpractice expense components of physician reimbursement continued to be paid on the basis of historical charges and were not scheduled to be rolled into the rbrvs methodology until 1999, when they would be implemented over three years. This plan was ultimately delayed by BIPA 1999. 70 Information on False Claims Act Litigation, GAO-06-320R (December 15, 2005): 26. Recoveries grew as well; the New York Times reported that “from 1997 to 2000, recovery in civil fraud cases grew by more than 50 percent, and last year, of the $1.5 billion recovered by the federal government from fraud cases generally, $840 million was from those involving healthcare.” Jennifer Steinhauer, “Justice Dept. Finds Success Chasing Health Care Fraud,” New York Times, Jan. 23, 2001. 71 “Prescription for Power,” Common Cause, June 2001. No one can claim that lobbying is illegal; it is of course part of the American political world, accepted as defending one’s interests before governmental authority. Such lobbying helped to defeat President Clinton’s AAC plan. 72 “Remarks by the President in Radio Address to the Nation,” White House Office of the Secretary, Dec. 13, 1997. 73 For instance, in 1997, the BBA contained a requirement for the HHS Secretary to study the effects of the 95 percent of AWP policy and report to Congress by July 1, 1999 (Balanced Budget Act of 1997, Pub. L. No. 105-33, 111 Stat. 251 (1997)). The HHS report found mixed evidence on the question of whether the AWP rate of growth accelerated. A Chicago Tribune report notes that Abbott raised the AWP for one drug, Lupron, by 10 percent from 1998 to 1999, “offacting (sic) the lower government allowance.” This was precisely the concern some in the Congress had in mind when ordering the study. See Andrew Zujac and Laurie Cohen, “Feds Probe Abbott Venture’s Drug Sales,” Chicago Tribune, May 23, 1999. A second instance was in 1999, when Congress passed the Medicare, Medicaid and schip Balanced Budget Refinement Act (BBRA). (Medicare, Medicaid and schip Balanced Budget Refinement Act of 1999, Pub. L. No. 106-113, 113 Stat. 1501 (1999).) There, one provision required the GAO to study the “adequacy of Medicare payments to oncologists” under the recently implemented rbrvs overhaul for administrative expenses. 74 Medicare, Medicaid and schip Benefits Improvement and Protection Act of 2000, Pub. L. No. 106-554, 114 Stat. 2763 (2000). 75 The GAO concluded that physicians were able to obtain “incident-to” drugs at prices well below AWP. “For most physician administered drugs, the average discount from AWP ranged from 13 to 34 percent. Two physician administered drugs had discounts of 65 percent and 86 percent.” (Payments for Covered Outpatient Drugs Exceed Providers’ Cost, GAO-01-1118 (September 2001): 4.) Oncologist administrative costs—reimbursed by the practice expense rbrvs component rolled out in 1999—were 8 percent higher than with the old charge-based system. Another component—practice expenses associated with nonphysician care—was found to be somewhat underpaid. 76 Medicare, Medicaid and schip Benefits Improvement Act of 2000, Pub. L. No. 106-554, 114 Stat. 2763 (2000), sec. 429. 77 DeParle tried to use DOJ AWPs for certain part B drugs. Congress in an interim bill, labeled as a Medicare Anti-Fraud Bill, relieved HCFA of the statutory obligation to use AWP, however. (This occurred after Bliley’s letters to HCFA following his initial investigation.) It required, with Stark’s approval, that HCFA take no such action until the completion of a GAO study also required by the bill. The presentation of the GAO study occurred at the Sept. 21, 2001, hearings at which substantial additional information was provided to the Congress as detailed above. 78 These prices had been collected from a federal/state investigation originating from the VAC qui tam allegations. Namfcu Letters from Feb. 16, 2000, and May 18, 2000. 79 Centers for Medicare and Medicaid Services Program Memorandum, “An Additional Source of Average Wholesale Price Data in Pricing Drugs and Biologicals Covered by the Medicare Program,” HCFA-Pub. 60AB (Washington, D.C.: U.S. Department of Health and Human Services, 2000). 81 Medicare Prescription Drug, Improvement and Modernization Act of 2003, Pub. L. No. 108-173, 117 Stat. 2066 (2003). 82 Robert Pear and Robin Toner, “A Final Push in Congress,” New York Times, Nov. 23, 2003; and see GovTrack, vote totals on the Medicare Prescription Drug, Improvement, and Modernization Act of 2003. 83 Medicare Prescription Drug, Improvement and Modernization Act of 2003, Pub. L. No. 108-173, 117 Stat. 2066 (2003), sec. 301-2239. The new reimbursement formula would be 106 percent of ASP. 84 Average Sales Price is the weighted average of all nonfederal sales to wholesalers net of chargebacks, discounts, rebates, and other benefits tied to the purchase of the drug product, whether it is paid to the wholesaler or the retailer. 85 Martin Sipkoff, “As Drug Payment Model Changes, Confusion Grows among Insurers,” Managed Care (Feb. 1, 2017). 86 Kaiser Family Foundation analysis of CMS 2006-18 Part D plan files. 89 Medicaid beneficiary data downloaded from the Kaiser Family Foundation, “Total Monthly Medicaid and CHIP Enrollment,” exhibit A. 90 See CDC Health Insurance Coverage statistics. 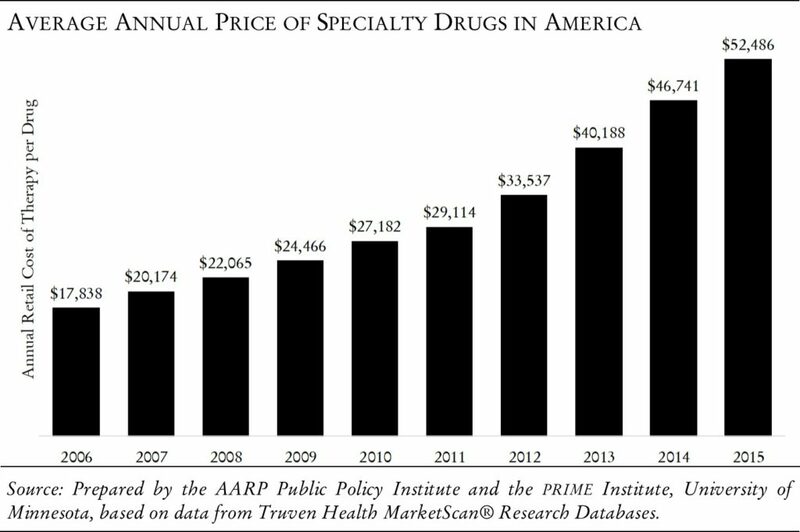 91 Stephen W. Schondelmeyer and Leigh Purvis, “Trends in Retail Prices of Specialty Prescription Drugs Widely Used by Older Americans, 2006 to 2015,” AARP Public Policy Institute. 92 Ben Popken, “EpiPen Price Hike Has Parents of Kids with Allergies Scrambling ahead of School Year,” NBC News, Aug. 17, 2016. 93 “I think it will be huge,” former Turing chief executive Martin Shkreli wrote in a Aug. 27, 2015 email after his company bought a decades-old drug and made plans to hike its price more than 5,000 percent. “Almost all of it is profit and I think we will get three years of that or more. Should be a very handsome investment for all of us.” Quoted in Ed Silverman, “‘Pow!’ ‘It will be huge.’ Emails Show Shkreli’s Team Exulting at Drug Price Hike,” Stat, Feb. 2, 2016. 94 Bram Sable-Smith, “Insulin Prices Have More Than Doubled in the Last 6 Years—and Now People Are Dying Because They Can’t Afford the Drug,” Time, Sept. 13, 2018. 95 Randi Hutter Epstein and Rachel Strodel, “Diabetes Patients at Risk from Rising Insulin Prices,” New York Times, June 22, 2018. 97 Meg Tirrell, “In Drug Price Hearing, Congress Tries to Answer Some Basic Questions,” CNBC, June 13, 2017. David Nather, “‘It’s Not Funny, Mr. Shkreli. People Are Dying,” Stat, Feb. 4, 2016. 98 Health at a Glance 2017: OECD Indicators (OECD, 2017), 22. U.S. men live on average to the age of 76.3, OECD men 77.9. U.S. women live on average to the age of 81.2, OECD women 83.1. 99 Payment Policies to Manage Pharmaceutical Costs, a report from the Pew Charitable Trusts, March 2017. 100 “Just a few years ago, infection with the hepatitis C virus guaranteed a slow and certain death for many. Available treatments were effective in about half of all patients, and the side effects could be awful. Things changed in 2014, when a new medication called Harvoni was approved to treat the infection. With cure rates approaching 99 per cent and far fewer side effects, the medication became an instant blockbuster. Sales topped $13.8 billion in 2015. But then an odd thing happened—sales began to drop precipitously. Harvoni, in conjunction with four other hepatitis C drugs, is projected to generate only $4 billion this year, a three-fold decline in as many years. Part of this decline is due to new competitors entering the market. But according to analysts at Goldman Sachs, another reason could be that the drug’s cure-rate erodes its own market. In a private report leaked to news outlets in April 2018, the Goldman Sachs analysts caution against investments in pharmaceutical or biotechnology companies aiming to develop outright cures, and cite Harvoni as a case study. It’s a simple point to make—if profit is your goal, then a product that eradicates its own demand might not be a wise investment.” Clayton Dalton, “Chronic,” Aeon, Aug. 7, 2018. 102 Robyn Tamblyn, et al., “The Incidence and Determinants of Primary Nonadherence with Prescribed Medication in Primary Care: A Cohort Study,” Annals of Internal Medicine 160, no. 7 (April 1, 2014): 441–50. 103 Peter A. Ubel, et al., “Study of Physician and Patient Communication Identifies Missed Opportunities to Help Reduce Patients’ Out-of-Pocket Spending,” Health Affairs 35, no. 4 (April 2016): 654–61. 104 Stuart Silverstein, “Swarms of Drug Lobbyists and Campaign Cash Stymie Bid to Restrain Medicare Prescription Costs,” FairWarning, Oct. 18, 2016. The foremost example of this “revolving door” was Representative Billy Tauzin of Louisiana. As chairman of the powerful energy and commerce committee, he shepherded the Medicare Modernization Act of 2003 through Congress. The law added a drug benefit to the Medicare program, but prohibited the federal government from negotiating prices on behalf of beneficiaries. Instead, such powerful negotiating leverage would be diffused among hundreds of private health plans, or sponsors. (See Pear and Hulse, “A Final Push in Congress.”) That year, while still in Congress, Mr. Tauzin paid over a $1 million for a large Texas hunting ranch. He invited executives and lobbyists with interests before his committee to join a new hunting club on the property as dues paying members. Months after the bill’s passage, in 2004, the Pharmaceutical Research and Manufacturers of America hired him as their chief lobbyist, at a whopping salary of $2 million per year. (See Robert Pear, “House’s Author of Drug Benefit Joins Lobbyists,” New York Times, Dec. 16, 2004.) Amazingly, none of this suspicious activity seems to have broken any laws. 105 Of course, there are economic strategies as well as political ones. Drug companies engage in a range of strategies to extend the durations of patent protection and market exclusivity. These include preventing generic companies from acquiring the brand drugs necessary to complete clinical trials, and making small, insignificant alterations to an existing drug to gain additional years of protection. See Aaron Kesselheim, Jerry Avon, Ameet Sarpatwari, “The High Cost of Prescription Drugs in the United States: Origins and Prospects for Reform,” Journal of the American Medical Association 316, no. 8 (August 23–30, 2016): 858–71. Probably the most egregious of these business strategies is actually paying generic drug companies to refrain from bringing their drugs to market. In 2013, the Federal Trade Commission filed suit against such arrangements. The FTC argued that such payments were a way to inhibit competition in the marketplace and thus illegal. After a federal appeals court upheld the legality of such payments, the FTC appealed to the United States Supreme Court. The Court agreed in June 2013 that such deals could indeed be a violation of antitrust law, but did not find a presumption that they were always illegal. The number of such deals has fallen in recent years, but the practice continues. John Pakutka is a health care management and policy consultant; he assists health care systems and payers, digital health companies, and health advocacy organizations. He is the coauthor of Social Insurance: America’s Neglected Heritage and Contested Future (CQ Press, 2013); summary available at sixthreats.com. Theodore Marmor is professor emeritus in three units of Yale University: the School of Management, the School of Law, and the Department of Political Science. He is the coauthor of Social Insurance: America’s Neglected Heritage and Contested Future (CQ Press, 2013); summary available at sixthreats.com.